From computers, phones, to printers, getting the right equipment is crucial in making sure that your workplace runs as smoothly and efficiently as possible. Aside from finding an authorized and trusted dealer, it’s also important to know how specific equipment can benefit your business. Such information will help you better choose the right options for your specific needs. In doing so, you can save time and money when it comes to updating or upgrading your office. Below, we’ll take a closer look at multi-function printers and their benefits when it comes to improving office efficiency. Small or home-based offices will find a monochrome multifunction printer as the first and easy choice for their needs. There is a need for growing businesses to cut and save costs, which is why a reliable black and white printer would be the best choice for them. A multifunction printer will allow you to print, scan, and even send faxes at the same time. Black and white multifunction printers such as the Konica Minolta bizhub 458e are reliable multifunction machines that can scan and print and have the capability to handle large printing jobs in a short amount of time. This type of printer also supports mixed media production which means that it can staple, fold, and put together documents in a more presentable way. Businesses handling a lot of visually demanding documents and other productions will do best with a color multifunction printer. Aside from being able to produce colorful and visually-appealing outputs, getting a colored multifunction machine is far more cost-efficient. Once you move past a small operation, you’ll likely run into the need for color printing. This is why small and medium-sized businesses will find plenty of uses for this equipment and will find a great multi-function colored printer to be a valuable investment as a business or operation grows. Given how much the times have evolved and how it had taken machines along with it, multifunction printers must also have other advantages. The Konica Minolta bizhub C659 increases productivity through dual scanning capabilities, mobile connectivity support, and easy configuration settings. Although it requires a slightly higher investment, it’s a worthwhile one which can handle massive colored prints quickly. Even big businesses don’t always have a ton of office space. If this is the case for your business, a compact multifunction printer is what you need. These types of printers aren’t only smaller in terms of size, but also require less maintenance and have lower costs as well. In terms of usability, a good compact multifunction printer provides good user-friendliness despite having most of its functions combined together in a smaller and more compact body. Nevertheless, these machines are equally as powerful and packed with many other functions to benefit your business. The Konica Minolta bizhub c3351 is a small but mighty machine guaranteed to increase document management productivity in any environment. We understand that it can be difficult to find the machine that best suits your needs. Choosing among a wide variety of Konica Minolta multifunction printers can be challenging. However, you can be certain that all deliver high levels of efficiency, productivity, data security, and the ability to connect with the latest office technologies today. For a more diverse and flexible business, getting print solutions might be a better option. For an office upgrading to a better multi-function printer, it’s definitely confusing. Allow Caltronics to assist you and help you choose the right one for your business. This entry was posted in Konica Minolta, Products, Solution and tagged best office equipment, best office printers, business printers, konica minolta printers, multifunction printers, printers for offices on April 12, 2019 by riehlt. Document Management is organizing, storing, and tracking electric documents. In simpler terms, it is managing information from paper in a way that makes it easy to access on a computer. Why Bother With Document Management? Despite offices becoming more and more digital, documents hard copies are often still important, but they aren’t ideal for work collaboration. A lot of people now rely on online communications despite being in the same office or floor. This creates a higher possibility of misunderstandings or miscommunications regardless of the business. Keeping documents at the ready can save operations from that. Troubles with communication can cost a business time and resources. A great document management system will outline the proper storage procedures for hard copies as well as for their electronics counterparts. Getting started can be a bit overwhelming, especially if your files are scattered all over the place. Start by organizing everything little by little. Once you’ve done that, devise a system. Create a plan to manage them that works for you the best. You can use a sticker system, a folder system, or any system that will work. When saving documents electronically, it helps to have a standard naming system so you can easily search for the documents later. Allow your system to evolve. Always think of ways you can do your job in a faster and more efficient way. By doing so, you will save yourself a lot of time. In business, documents are so important. You never know when you will need to reference something again, and when that time comes, you want to be able to find what you need without launching a massive search. When storing documents, whether they are hard or electronic copies, be sure you are thinking ahead so that the documents will be easy to find and in perfect condition when you next look for them. When creating digital copies of documents, it’s important that they’re clear, legible, and ready for reproduction. Getting a quality printer and scanner will let you do exactly that. Choose from HP’s catalog of office equipment and get one for your business today. This entry was posted in Products and tagged business communications, document management, handling focuments on March 15, 2019 by riehlt. Although a lot of marketing happens online nowadays, printed marketing collateral hasn’t lost its relevance. Whether it’s a brochure, a flyer or a calling card, your marketing materials are often the first point of contact for your ideal customers. They are the tangible expressions of your brand that put your business right in front of your intended audience, and as such, it’s only essential that you make a good first impression with high quality printing. Otherwise, if your printed marketing materials are low quality, your prospects will assume your products and services are too. Here’s how you can make the most of your printer to create visually appealing print materials and promotional products. The type of paper matters a lot in the quality of the printing. Whether it is rustic and textured, coated or uncoated, silky and smooth or heavy weight and light – the choice of paper plays a huge role in the outcome of your materials. If you’re not sure what finish to use, our team of experts can help you in selecting the right paper stock for the right product. Printing technology is getting more sophisticated by the day. This holds true to the kind of inks as well. Every ink type offers unique benefits so make sure to know where it’s meant to be used. For example, pigment inks work best for photo prints whereas dye-based inks are great for marketing materials. Printers often have specific settings for the type of paper being used. Different papers require different amounts of ink and different proportions of ink colors to produce the correct final colors. When switching between different printing tasks, it’s important that you update the settings to get excellent results. Quality printing involves the use of high quality materials. Paying careful attention to the paper stock and inks for example can make a huge difference. Printing techniques and print finishes are also a huge factor to consider. Of course, quality printing is also about getting a high quality printer. 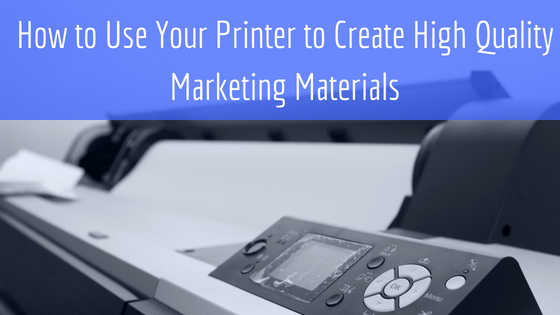 Your marketing material is only as great as the printer it’s produced on. We suggest using Konica Minolta to take your marketing materials to the next level. The Konica Minolta offers a wide range of printers and multi-function machines for every marketing need. It is equipped with advanced printing technologies, ensuring you leave a strong impression to your customers and clienteles. With Konica Minolta you turn your ideas into reality at an affordable cost. Regardless of what printer you use, you create polished and superb print products that match your marketing goals. For larger-scale materials such as posters, its wide format inkjet printers can deliver stunning graphics and ink quality. Konica Minolta also offers digital press solutions that can provide quick and efficient printing of short run materials. There’s no need to make or change plates required with offset printing while maintaining the color quality. There’s a whole lot more of solutions Konica Minolta can provide. If you need any assistance, contact us today. This entry was posted in Konica Minolta, Products on July 18, 2018 by riehlt. Working with PaperCut software from Caltronics helps cut down costs for printing supplies by integrating the printing system into one easy program that can be monitored for use. However, this is just one part of PaperCut that makes it convenient for the administrator to track usage. PaperCut also comes with a ton of features that make it user-friendly for the people who will use it for day-to-day assignments, such as teachers and students. How Does PaperCut Help Students and Teachers? The following are just some ways that PaperCut can help students and teachers track their projects and paper usage. One way that PaperCut helps with organization is through user tracking. For example, at your school, each student is sure to have an ID. PaperCut can be securely linked to their student ID to allow them to have their own queue where they can track how much they are printing and the projects they need to have printed. You can even set specific parameters for each user such as how much a student can print versus how much a teacher can print. When printing on a global printer, such as one in the school library, a lot of mix-ups can happen where one student will get the documents and papers of another. The user-specific printing process is secure and safe, meaning that anything that is printed out will only be printed by the user who requested it. One of the most convenient things about PaperCut comes from its global device integration. That means a variety of printers can be used on one global queue. The user can send a printing project to the printer from any device, including mobile phones, tablets, and computers. Once the project is in the queue, the student can use their ID on any printer in the system to print out their project. All of these qualities are just further conveniences added into PaperCut’s printing management system. Overall, PaperCut can help you sort out all your printing needs by streamlining the printing process for students, while also saving the school administration money on wasted resources. This entry was posted in Products and tagged education, educational software, papercut, papercut software, prnting, school software on October 17, 2017 by riehlt. Attracting attention through print media is still an incredibly important part of a marketing strategy for a new business or product. Today, much of the focus is on digital advertising because of how many people use the internet, and how cheap it can be. But when printed marketing materials are properly placed and well made, they can have just as much if not more of an impact reaching a desired demographic. Relying on an outside company to print materials can cost more than it’s worth. By having your own wide format printer, you will be able to control every detail and get immediate feedback if something did not print correctly. There is nothing worse than wasting money on hundreds of pamphlets or a giant poster that has a minor text or spacing error. Keeping things in house makes it easier. Not all wide format printers are made the same, and some work better for different settings than others. When you are looking for a great wide format printer for marketing purposes, you should look for how powerful it is. The HP DesignJet Z5600PS is one of the newest options from HP that Caltronics offers to help you upgrade your office’s productivity. The DesignJet Z5600PS is specially made for flexibility and efficiency that will help anyone producing marketing materials for themselves or for clients. The 44” plotter is large enough to fit almost any type of media, and with a 2400 x 1200 dpi print resolution, the results will look fine-tuned every time. Improving the workflow of printing is an integral step for an office to run smoothly. And the smoother the printer runs, the quicker jobs will get done. The DesignJet Z5600PS features a large hard drive and file processing, so it can manage multiple demanding jobs at a time. Standard printers seriously limit the options an office has when it comes to printing marketing materials that would otherwise require a third-party print service. Caltronics Business Systems can help you upgrade your print environment to work at maximum efficiency. With their expertise and fleet of printers from HP, your office will successfully get out larger, more appealing printed advertising. This entry was posted in Products and tagged DesignJet Z5600PS, hp, printers, Products, wide format, wide format printing on August 28, 2017 by riehlt. There is a lot of fuss and excitement over the new multifunction printers and copiers found in nearly every office that can afford to upgrade; and for good reason. These new MFPs, like Konica Minolta models available from Caltronics, have capabilities that older copiers did not, and they can also help an office become more environmentally friendly and save money by easily managing toner and paper usage in order to better fit the needs of the company while also ensuring that more attention is paid to waste. But not every office needs one giant multifunction printer. And there are many individuals who work in offices but require their own printer in their office, whether it is for the ability to immediately retrieve something or because they feel more comfortable printing confidential documents from their personal printer. Whatever the reason, if you are a user of a personal printer, you know how essential it can be to your daily work. You need one that is reliable from print to print. Some will wait until their printer literally will not print a page before investing in a new one, even if it’s been sputtering, printing unevenly, jamming, etc. for weeks and weeks. Caltronics Business Systems is a certified dealer of HP printers and offers a wide array of HP printers that are compact and work great for those who need to upgrade their personal printer in their office or place of business. These printers come with a variety of different options that can help you narrow down your choices. Do you expect a printer that can connect wirelessly through Wi-Fi or Bluetooth? Do you need a printer that can also scan images to email? Do you need a printer that can print in black and white or color? Does pages per minute matter to you? Whatever needs you have, you can bring them to Caltronics, and they can help you find exactly the right personal printer for you and anyone else in your office who may need one. This entry was posted in Products and tagged Caltronics, Caltronics Business Systems on April 22, 2016 by riehlt. Educators and administrators alike are always looking for ways to save time, streamline workflow, and improve productivity with their document solutions. Whether it be in classrooms, school districts, universities, or libraries, we know how important it is to have a student records management system that is environmentally friendly, flexible and easy on your wallet. Does that sound too good to be true? Then you haven’t heard of Caltronics! Caltronics works exclusively with Konica Minolta, a leader in advanced imaging and networking technologies that brings together unparalleled advances in security, print quality and network integration, to provide scalable document systems that maximize the power of technology and improve results. Create exams and assessments with ease and get instantaneous results. Exam grades are automatically pulled back into the back-end data analytic system that compares testing results to state standards and integrates with the student information system. Protecting student confidentiality. FERPA-compliant features are built into every Konica Minolta bizhup MFP. This requires users to identify themselves and restricts access with secure authentication in any form including passwords and standard HID cards. Account-tracking functionality. Your bizhub can be used to assign costs to departments, grants, or individual students and teachers with panel-integrated cost recovery systems from Equitrac, Pharos, Konica Minolta PageScope Enterprise Suite, and JAMEX and ITC vending terminals in public-access areas. High quality course content in-house. Notice the cost savings immediately when you use Konica Minolta’s digital presses to create high-quality, cost-effective color or B&W course materials. Helping educational applications protect the environment with Konica Minolta’s Clean Planet Program. All bizhub models feature environmentally friendly Simitri® toner for clean, crisp print/copy quality, high toner yields to lower operating costs. With the help of excellent Konica Minolta products, Caltronics MPS offers world-class print management—eliminating the stress and abundance of time spent managing the print environment, as well as helping you realize significant cost savings. Our team of specialist, combined with our knowledge of the processes, and leading edge technologies make the Caltronics difference: from the assessment and proposal phase, to setup and maintenance, reporting and quarterly reviews, and constant optimization efforts, our team is dedicated to continually providing you with the most successful document workflow solution for your environment. No matter your needs, our specialized Caltronics team is able to provide special attention and a customized solution to each of our MPS customers. Want to learn more about what Caltronics can do for you? Check out the services we offer on our website or call us today at 1-800-775-9545! This entry was posted in Education, Konica Minolta, Products, Services, Uncategorized and tagged Caltronics, education, managed print, tests and exams on January 27, 2015 by riehlt.